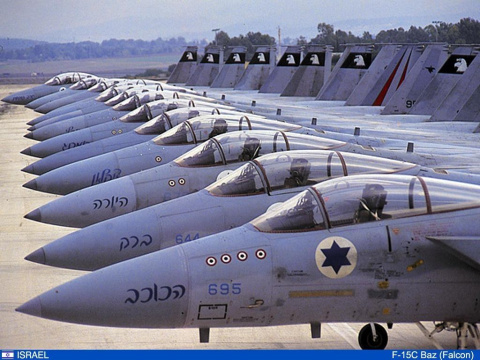 On 5th June, Israel finished a military exercise in the Mediterranean involving F15 and F16 fighters and combat helicopters covering a range of 900 miles, the distance between Israel and Iran’s nuclear plant at Natanz. It is well-known that there is bad blood between the two governments. That the Tel Aviv government fears that its fiercest enemy will develop nuclear arms is part of the imperialist challenge of the area. That the Tehran government is using anti-Zionism as a battering ram to escape the politic and economic isolation in which it has been placed, is just as obvious. The Israel manoeuvres had a double aim: that of sending a clear message to those in charge in Iran, and that of concerting with its American ally the possible strategies to be used in a real attack. In the first place, we are witnessing a game played by two imperialisms of the area which are struggling over the balance of power in the area itself, where the Iranian nuclear question plays a very important role. President Ahmadinejad’s real or presumed quest for nuclear arms should not obscure Israel’s real, but never officially declared, nuclear capacity. Tel Aviv has always denied being a member of the club of atomic countries and has never signed any nuclear non-proliferation treaty, but everyone knows that its missile armoury contains at least 150 nuclear warheads. Olmert doesn’t want to give up this strategic military monopoly in the Middle East, nor, even less, does he want his declared enemy to join the member list of the nuclear club. In the second place, the imperialist game assumes a much wider scale, involving the interests of the USA, Russia and China. The two contenders, although following their own interests, are constrained to play the double role of subject and object in an imperialist quarrel which goes beyond their horizons. Through the sharpening of the international crisis and because of its geographical location which will see the passage of more oil and gas pipelines, the area between the Eastern Mediterranean and the Persian Gulf is the theatre of political confrontations of military dimensions with bitter and intimidatory tones. In December 2007, the Ahmadinejad regime put on a show of force with a series of naval exercises in response to the huge presence of the American fleet stationed at the entrance to the Straits of Hormuz. Fol-lowing this, there has been no shortage of episodes of friction between the two line-ups in the sea of Oman. According to the utterances of Rahim Safavi, head of the Guardians of the Revolution, Iran wanted to respond in deed to the rumours of an imminent attack on Iran by the American military. Now it is Israel’s turn to go fur-ther, even if behind the screen of an exercise in the waters of the Western Mediterranean. Simultaneously, US diplomacy is pushing for a tightening of the sanctions against Iran. China and Russia, in response, are arming their ally. A year ago, Russia had already concluded a double accord with Tehran. In part, it technologically sustains and manages all nuclear activity, civilian and other, and it modernises the Iranian military structure with new long-range Sa200 and Sa300 missiles capable of hitting targets at distances of 6000km. China, Iran’s second sponsor, is interested in the supply of Iranian oil and, strongly opposed to American interference, is further replenishing Ahmadinejad’s arsenals with their latest Shahab missiles which carry clusters of ten warheads. These are deafening sounds of war, but there are those who say that, in reality, nothing is going to happen and that the menacing movements made by Israel and the USA are nothing but a desperate attempt to mask internal situations full of difficulties. Olmert is on the edge of a nervous breakdown because of a trial which sees him accused of corruption, amongst other things, and he doesn’t want to be placed in a tight spot without having even pushed a hard line against his Iranian enemy. Bush is about to leave the White House as the most unpopular President since the Second World War, and he doesn’t want to exit the scene with no victories, whether diplomatic or military, after having suffered the shame of defeat (or at least non-victory) in the two wars he has waged and which he imposed on his own, and international public opinion, through lies and blackmail. True though these factors may be, they belong to the category of incidental facts, and the real determining factors are very different. The main driving force is the devastating consequences of the economic crisis cutting swathes through the capitalist world. The growth of the real economy is slowing, the return on capital is shrinking, and through the financialisation of the crisis, parasitism is growing exponentially. It is a world following the path of speculation as an outlet for its own contradictions, shifting capital from the productive to the speculative sector, from loan derivatives to the futures for energy sector raw materials (gas and oil) and for agriculture, starving hundreds of millions on the way. The same crisis accelerates the tendency of capital to conflict on the markets for strategic raw materials and currency, and, when necessity demands it, these problems are resolved by force. Military manoeuvres in the Mediterranean and the Persian Gulf, the arms race, US aid to Israel, and Russia and China’s military supplies to Iran are signs of the times, times whose rhythm is beaten out by the international economic crisis and the sharpening imperialist tensions. Crisis, speculation hunger and war are the perspectives that capitalism offers the entire world. It is to the international proletariat that the task of opposing this perverse course falls. Only it can once more put forward the revolutionary road, as an indispensable condition for the construction of a society fit for human beings, instead of being based on the laws of capital and profit, with all their devastating consequences. War in Georgia: Who Will Control the Oil and Gas of the Caspian Basin?